Modern management theory has been established on the ashes of Taylorism, emphasizing control over accountability, conformity over uniqueness, and constraint over freedom. 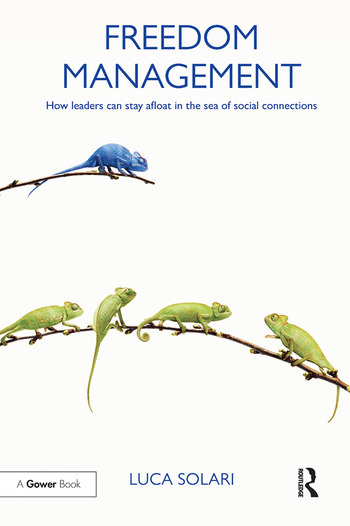 Leadership and management theories and the practical approaches of this age of society can be understood as an ongoing struggle to overcome the boundaries of such a concept of organizations and society. Also latter movements, like empowerment or the competence based waves of change have left what we do in organizations largely unscathed. Organizations today are often bereft of a strong leadership function and the result is a decline in overall engagement. Luca Solari contends that this is because the change ahead requires a complete reshuffling of our conceptions of what it means to run an organization, and this will not come without pain for those in charge of managing, who are unable to shift their roles. It comes as no surprise that the complex pattern of preexisting interests acts like a powerful shield against this change within government, society, and business organizations alike. This book provides an essential argument as to why contemporary organizations need to change and offers practical guidance on how to overcome the waves, while helping your organization to thrive in this new era of management. This book will appeal to leaders, as well as those involved in human resource management and organizational change. Luca Solari is a Professor of Organization Theory and Human Resource Management at the University of Milan and Professor of Human Resources in the Faculty of MIP School of Management in Milan for the MBA program. He presently acts as Advisor to EY (former Ernst & Young) People Advisory Services to promote innovation in management and people management. Luca has extensive experience in design and delivery of Corporate Executive training programs, and after a long career as a Strategic Consultant in Organization and HRM, he presently acts as corporate sense maker, blogger, and social media experimenter, investigating the future of work and the future of productivity. Luca’s academic work comprises strategy, organizational design issues, and human resource management strategies and practices, with a vast array of research and strategic consulting experience in different industries ranging from service to manufacturing. Luca holds a PhD in Organization and Management Theory.